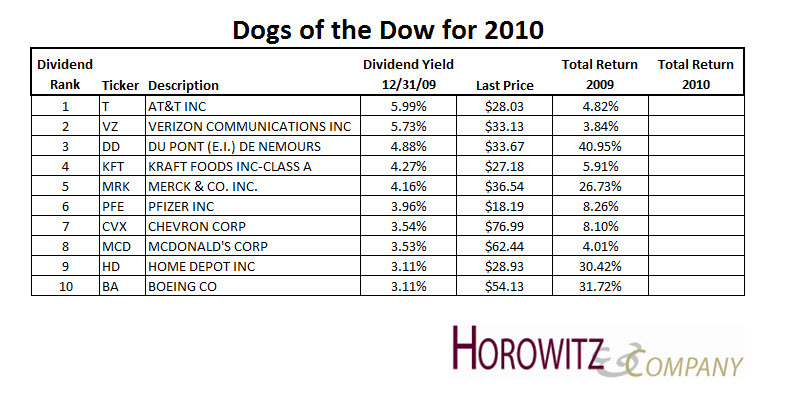 Each year, the Dogs-of-the-Dow are recalculated in January to find the 10 DJIA members with the highest dividend yield. This year there have been few changes to the names that look to be included in this strategy for 2010. We also need to consider the fact that higher yielding stocks are concentrated within a small subset of the DJIA as fewer than the 30 pay dividends. The contrarian view which this strategy/screen is based on has often outpaced the DJIA. That is appealing in a time when there is such a great deal of uncertainty. Below is the list of “Dogs” based on current prices and yields. The lower table also shows stocks which were included in 2009 along with performance etc. 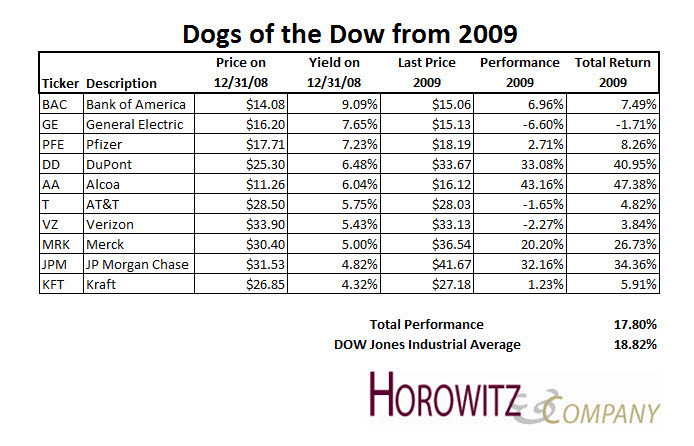 Note that in 2009, the Dogs lagged the DJIA. **In the the book, The Disciplined Investor – Essential Strategies for Success, there are several screens and an entire chapter devoted to the subject of Quantitative investing. Each year, the <strong>Dogs-of-the-Dow</strong> are recalculated in January to find the 10 DJIA members with the highest dividend yield. This year there have been few changes to the names that look to be included in this strategy for 2008. Some of the reason is because of the problems that occurred in 2007 for some of the DJIA names. We also need to consider the fact that higher yielding stocks are concentrated within a small subset of the DJIA. As we are seeing an immense level of volatility, it seems to be a good idea to look at a strategy that invests in companies that have (or at least seem to have) high quality and provide a decent dividend yield. The benefit to investors is that these are Mega-Caps and are considered “blue-chips.” The contrarian view which this strategy/screen is based on has often outpaced the DJIA. That is appealing in a time when there is such a great deal of uncertainty. Below is the list of “Dogs” based on current prices and yields. The table also shows stocks which were included in 2007 and, by a process of elimination, reveals which stocks should be in the 2008 list.